To complement the custom services Metal Fabricators and Welding regularly provides to clients, we’ve also become proficient at building specific industrial products. We’ve been producing items like tube shields, bulk handling equipment, and concrete products for decades. We still incorporate our custom approach in everything we do, tailoring these products to customers needs for size, quantity and even branding them. A growing aspect of our business is our high quality handling and storage equipment. We manufacture a variety of storage vessels for the handling of dry bulk equipment. Working with frac’ing companies as well as aggregate wholesalers, we’ve grown accustomed to a customized approach to fabrication. We work with our clients to specify their equipment so it suits their specific application. Metal Fabricators and Welding helped pioneer metal trenching for SAGD facilities, compliant with ERCB Directive 55 standards. We design our trench based on the needs of the facility, working with our clients to ensure that all government regulations are met, timelines are adhered to, and all while maintaining a watchful eye on the budget provided. 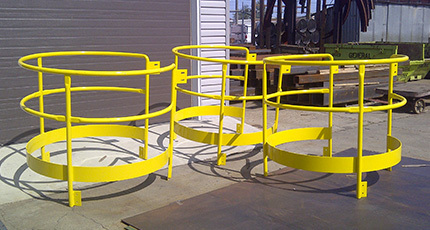 To date we’ve manufactured in excess of 20,000 lineal feet specifically for use in Northern Alberta’s Oilsands. 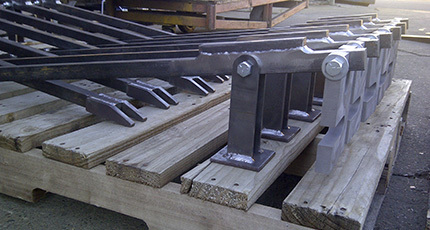 As part of a structural foundation, we produce embedded steel and pile caps for building construction. Our equipment has the capacity to produce hundreds of identical products for large scale construction projects. We’ve been making tube shields for coal-fired power plant boilers for over 30 years. We understand the short lead times and deadlines for plant shut downs, and we’re capable of meeting these time demands.